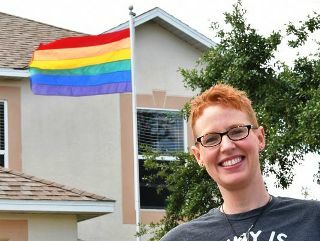 Jenifer Raymond's rainbow flag, commonly known as the gay pride flag, has flown high above her home in the Ashwood Lakes subdivision for a couple of years. She'd heard no complaints about the flag, and even received a few compliments from neighbors about it. But for a few days this week, she was concerned she may have to take it down. An email that appeared to come from the homeowners association notified her landlord last week that the flag, a symbol dear to gays and lesbians, had generated complaints and been deemed "offensive" and "detrimental to the subdivision." "Allowing the flag to be flown is setting a precedence for other homeowners to fly other offensive flags," the email to Raymond's landlord states. One offensive flag cited as an example was the Confederate flag. But Wednesday, her landlord, Anthony Posada, said he was notified by the association that the email sent to him did not reflect orders from the board. What happened was one overzealous subcommittee member wanted the flag down. "The HOA board has apologized for the incident and told Jenifer that there was never an issue with the flag," Posada said. Jenifer Raymond said someone in her community wanted her to remove her rainbow flag. "It was the right thing to do," Posada said. "I support my tenant. Jenifer is a great tenant and a good person." Raymond said a board member arrived at her home Wednesday to give a personal apology. Homeowners Association Vice President Robert Kelso said Chris Fahey, who had been appointed as a member of the Architectural Review Committee, had sent the email to Posada. Fahey brought up the issue of the rainbow flag at a board meeting a few months ago, but Kelso said the board did not take action. "He didn't have the right or the authority to speak on behalf of the board," Kelso said about Fahey, who was removed from the Architectural Review Committee this week. Raymond, 39, is a mother of three who said she began living as a lesbian six years ago. "What's important to me, is a lot of what gay youth are facing today," she said. "There's still a lot of bullying in the schools. I belong to Space Coast Pride to help promote acceptance. That's what the flag stands for." The emails Posada received about the flag had started because he was inquiring about putting in a new roof. Then he received an email from Fahey about the rainbow flag violating community standards. Posada responded that the association's rules didn't prohibit such a flag, and he found a state statute preventing HOAs from limiting which flags can be erected at a home. Fahey responded with an excerpt from the community's ground maintenance section. It states "no weeds, vegetation, rubbish, debris, garbage, objects, waste, or materials of any kind whatsoever shall be placed or permitted to accumulate upon any portion of a lot, which would render it unsanitary, unsightly, offensive, or detrimental to the subdivision." The flag was considered an "object" and had been declared "offensive," Fahey wrote in the email. Fahey could not be reached for comment.